Measurements of a big sea on Titan, a moon of Saturn, show that it contains about 9,000 cubic km of mostly liquid methane. This huge volume is equivalent, say scientists, to about 40 times the proven reserves of oil and gas on Earth. 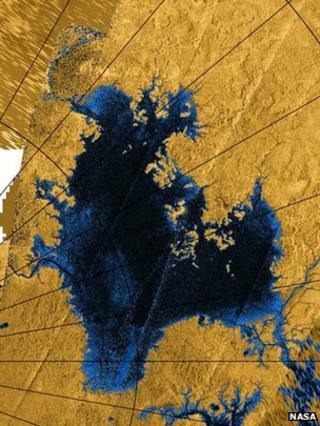 The extraordinary thing is that Ligeia Mare is only the second largest hydrocarbon sea on Titan. The body of liquid methane known as Kraken is perhaps five times as big. "What you're talking about here is essentially liquefied natural gas," explained Randy Kirk from the US Geological Survey (USGS). "People ask me if you could bring it to Earth, and that's a dumb idea on many levels. But what you might not realise is that there simply wouldn't be enough oxygen here to burn it all," he told BBC News. Dr Kirk was speaking in San Francisco at the American Geophysical Union (AGU) Fall Meeting, the world's largest annual gathering of Earth and planetary scientists. He was describing the latest work of the Cassini satellite, which has been orbiting the Saturnian system since 2004. One of the probe's key targets has been Titan - a moon that researchers believe may echo the conditions of early Earth. In many ways it is familiar - it has weather and rain; and this precipitation cuts mountains and valleys and pools into lakes and seas. But at minus 200C, Titan is quite alien, particularly so when it comes to its chemistry. Where water dominates on Earth, it is methane and other hydrocarbons that dominate on the 5,000km-wide moon. Media captionRandy Kirk: "We had enough data that we could now map the liquid"
Rather than a hydrological cycle, it has what might be described as a "methanological" cycle. The Cassini spacecraft has been slowly mapping Titan's surface, using radar to peer through its thick, hazy atmosphere. And the big news here at AGU is that the survey work for the northern hemisphere, the region where the seas and lakes are found, has achieved near-full coverage. This has enabled scientists to better assess the liquid bodies' distribution, and to say something more detailed about their size and evolution. For example, the radar instrument has been able to look through Ligeia Mare to the sea-floor to calculate a depth. It comes out at 160-170m. The signal also carries information about composition. Researchers say it is clear that the liquid is dominated by methane, but that the modelling suggests there ought to be contributions from a chemical cocktail that includes ethane, propane, butane, ethylene and even a trace of cyanogens. What intrigues about the distribution of the large seas is that they appear to be clustered in a block, measuring roughly 900km by 1,800 km. Randy Kirk says this suggests the liquid is pooling in fissures in the "bed rock" created by tectonic forces on the moon. "It's the straightness of the edges of that area and the coastlines in there that are the clue. Straight lines on planets - apart from those created by humans in the form of railroads and things like that - are most likely caused by faulting of the surface, because fractures propagate in straight lines," explained the Cassini radar team member. "If you have forces pulling apart that area of the crust, you have a tendency to form a pattern of straight lines and right angles and drop-down areas that the liquid then fills into." The smaller lakes, on the other hand, may cluster in areas where the ground has been dissolved through some as yet unexplained chemical process - but one that produces deep depressions in a way not dissimilar to the sinkholes that are weathered out of limestone on Earth by the action of water. These holes then act as repositories for the liquid methane. The Cassini mission is getting very low on fuel and is due to be terminated in 2017 by putting the probe on a destructive dive into Saturn's atmosphere. In the meantime, its radar passes will continue to fill in gaps in the scientists' surface map. One key flyover next year will allow the probe to take similar bathymetric measurements at Kraken. "Kraken's area is four to five times the size Ligeia, so if it has a similar depth profile you would expect it to have about 200 times the proven oil reserves on Earth," said Alex Hayes from Cornell University. "By way of comparison, the estimate for the volume of Ligeia is twice that of Lake Michigan. And for all the [seas on Titan], it is 15 times the volume of Lake Michigan." The Cassini mission is a cooperative project of US, European and Italian space agencies.